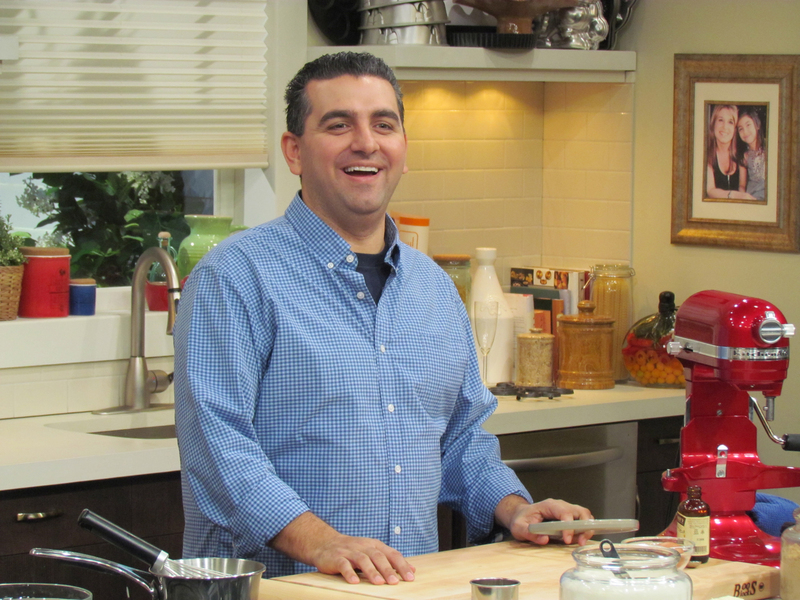 TLC’s beloved Buddy Valastro is not only a master baker and the Cake Boss, he’s also a great cook and star of the hit show, Kitchen Boss. Now he shares 100 delicious, essential Italian-American recipes—from his grandmother’s secret dishes to his personal favorites—with his own signature touches that make dinner a family event. TLC’s beloved Buddy Valastro is not only a master baker, he’s also a great cook—the boss of his home kitchen as well as of his famous bakery, Carlo’s Bake Shop. Home cooking is even more vital for the Valastro family than the work they do at the bakery. Every Sunday, the whole clan gathers to cook and eat Sunday Gravy—their family recipe for hearty tomato sauce. These nourishing meals are the glue of their family. Cooking Italian with the Cake Boss shares 100 delicious Italian- American recipes beloved by Buddy’s family, from his grandmother’s secret dishes to Buddy’s personal favorites, with Buddy’s own signature touches that make dinner a family event. Buddy Valastro is renowned worldwide as the Cake Boss, but Buddy knows far more than just desserts. He makes classic dishes like Pasta Carbonara, Shrimp Scampi, and Eggplant Parmesan even more irresistible with his singular flair and with old-school tips passed down through generations. With his friendly charm, he guides even novice cooks from appetizers through more complicated dishes, and all 100 easy-to-follow recipes use ingredients that are obtainable and affordable. Your family will love sitting down at the table to eat Steak alla Buddy, Auntie Anna’s Manicotti, Mozzarella-and- Sausage-Stuffed Chicken, Veal Saltimbocca, Buddy’s Swiss Chard, and mouthwatering desserts like Lemon Granita, Apple Snacking Cake, Cocoa-Hazelnut Cream with Berries, and Rockin’ Rice Pudding. Buddy’s recipes allow home cooks to become the bosses of their own kitchens, and anyone will be able to whip up a tasty and nutritious Italian dinner. 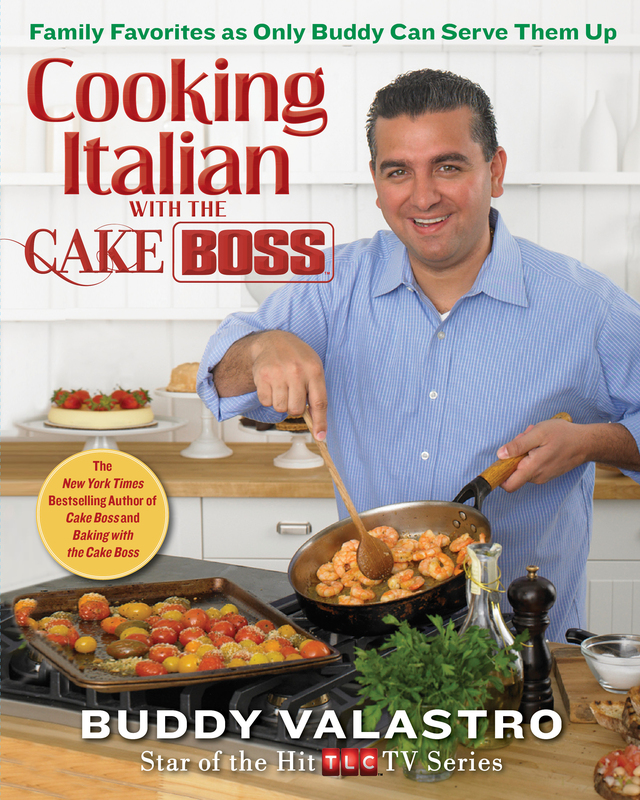 Filled with luscious full-color photography and with stories from the irrepressible Valastro clan, Cooking Italian with the Cake Boss shows how to create new takes on traditional dishes that will make your famiglia happy. My family, the Valastros, makes its living by baking and selling just about anything you can think of at Carlo’s Bake Shop. It’s what we’re known for. But there’s another side to our family and our relationship to food, and it’s just as personal, maybe even more personal, than what we do at the bakery. I’m talking about the recipes and dishes, meals and traditions that nourish our bodies and souls when we get home. Just like any other family, we enjoy chilling out and spending time together, and there’s no way we’d rather do that than around a table, a place that keeps us grounded and connected to each other as well as to the relatives who came before us. As proud as I am of our professional success, I’m just as proud that we’ve been able to continue making time for our family and extended family—and we’re talking a lot of people— to meet several times a week and eat together. And now I’m honored to share with you my family’s favorite recipes and to tell you the stories of what makes them so near and dear to our hearts. I hope they might become favorites for your family as well, that they help you create memories to last a lifetime, the same way they’ve done for us Valastros. In August 2009, a violent storm ripped through New York and New Jersey. The weather reports focused on how the storms uprooted a number of trees in Central Park, but for my family, the most noteworthy and heartbreaking damage occurred in New Jersey, where the extreme wind and rain devastated the local tomato crops. That’s true. My family, the Valastros, makes its living by baking and selling just about anything you can think of: cookies, pastries, pies, and—of course—our incredible theme cakes, at Carlo’s Bake Shop. It’s what we’re known for. What put us on the map. But there’s another side to our family and its relationship with food, and it’s just as personal, maybe even more personal, than what we do at the bakery. I’m talking about the recipes and dishes, meals and traditions that nourish our bodies and souls when we go home. There’s no more important recipe or dish in our lives than Sunday gravy, sometimes known as Sunday sauce, the pasta sauce we gather to eat together at the end of every weekend. We eat it so regularly that a few years back my family began our own tradition, one that we borrowed from my wife, Lisa’s, family: making huge batches of sauce at the end of the summer and canning it for each household, based on how many bushels of tomatoes each family orders. To give you a sense of how much Sunday gravy we go through in a year at my house, Lisa orders twenty bushels of tomatoes, and each bushel yields twelve large jars! Lisa and I began doing this after we were married, then we expanded the tradition to include our extended families at Carlo’s Bake Shop on Washington Street in Hoboken. Today we do it at our new, nearby factory. This is how it works: One team of relatives is on cleaning duty, scrubbing the tomatoes in the industrial sinks; another team quarters the tomatoes and gets them into the huge forty-, sixty-, and eighty-gallon steam kettles, along with olive oil, onions, and salt. The tomatoes are cooked until they break down, then we allow them to simmer for an hour. Another team processes the fruit through a machine that removes the skin and seeds, leaving us with a sauce. That sauce goes back into the kettle and is brought to a boil, then transferred to jars that have been sterilized in the dishwasher. We add basil and the jar is vacuum sealed, locking in all that incredible, just-cooked flavor until we’re ready to call on it throughout the year. In 2009, those storms wreaked havoc with our sauce making. Rather than just placing a huge order for tomatoes from one source, we had to scrounge around, securing a bushel here and there from area farms. Because tomatoes were so scarce, some family members had to drive out to farms in person and beg for a few bushels. But we were that determined to stick to our tradition and make our Sunday gravy! I’m not going to lie: What we ended up with after all that work and the cooking that followed wasn’t exactly world-class: The tomatoes had survived the storm, but they had a lot of scars and bruises. As a result, the sauce was runny and, even after all our patient simmering, the flavor wasn’t as intense as it usually was. But I’ll tell you something: We didn’t get upset. To us, the Sunday gravy of 2009 was a metaphor for life itself, especially life in a big, tight-knit family like ours. There will always be ups and downs, but we worked together to make the best of it, we were all there for our annual cooking and jarring ritual, and we left with those jars of sauce we treasured so much. It may not have been the best, but it was good enough, and next year, we knew, we’d have better luck. For me, that story is and always will be a gentle reminder of my family’s priorities and how far we’ll go to adhere to them: Even with all the fame we’ve enjoyed as a result of Cake Boss, when we’re away from the lights and cameras, live shows, and book signings, we’re just like any other family. We enjoy chilling out and spending time together, and there’s no way we’d rather do that than around a table, a place that keeps us grounded and connected to each other, as well as to the relatives who came before us. As proud as I am of our professional success, I’m just as proud that we’ve been able to continue making time for our family and extended family, and we’re talking a lot of people, to meet several times a week and eat together. And, as busy as we are at the bakery and filming our television show, we’ll still make time to hunt down bushels of tomatoes if we need to, in order to keep our traditions alive and well. Of course, Sunday gravy is just one thing that we eat. We also have lots of other family dishes—appetizers and salads, soups and pastas, main courses and desserts—that have become part of our repertoire over the years. In this book, I’m honored to share with you my family’s favorite recipes, and tell you the stories of what makes them so near and dear to our hearts. I hope they might become favorites for your family as well, and that they help you create memories to last a lifetime, the same way they’ve done for us Valastros.